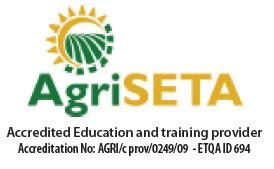 Our specialised agricultural training courses have all been designed to ensure a true learning experience. All theoretical content is thoroughly demonstrated and applied in practical sessions, following the classroom training. We have installed Dicla Tunnels, nursery tunnels and a multi-span greenhouse, complete with heating. This is essential in most parts of South Africa to teach the extension officers and farmers how to successfully grow crops in winter as well as in summer. We will concentrate on the types of varieties (indoor and outdoor) supplied by Rijk Zwaan, worldwide renowned for their quality seeds and service. These varieties are suitable for both greenhouse and open field cultivation, and are perfect to illustrate how to be productive at all times and to make any project sustainable. Broiler houses have also been installed and are fully equiped to teach learners how to run a broiler production. We also offer a course in animal production and have live animals available on our premises. Tractor operators will gain practical experience on our own tractors. For more information on our courses, please use the navigation menu above. You can also view our terms and conditions.